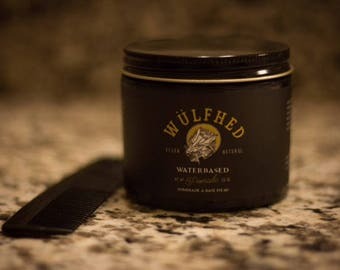 Pomade I will be reviewing is a water based from the unorthodox type. It was made by Michael Tafoya (San Diego), creator of the Grandad’s old fashioned line which he sold to Bryce Sims but Michael will come back with its line! Claire designed the labels for the jar. Let’s take a look! Presented in a 3.6 oz plastic jar with sticker labeling. Has a clean, not overloaded design, mostly dark gray with yellow and white. The pomade inside is white. Aqua, Ricinus Communis (Castor) Seed Oil, Hydrogenated Soybean Oil, Persea Americana (Avocado) OIl, Euphorbia Cerifera (Candelilla) Wax, Mangifera Indica (Mango) Seed Butter, Prunus Dukis (Almond) Oil, Sodium Borate, Tocopheryl (Vitamin E) Oil, Phenoxyethanol and Caprylyl Glycol, Fragrance. Water, Castor Seed Oil, Hydrogenated Soybean Oil, Avocado Oil, Candelilla Wax, Mango Seed Butter, Almond Oil, Sodium Borate, Vitamin E Oil, Phenoxyethanol, Caprylyl Glycol, Fragrance. Hydrogenated soybean oil: also called soy wax. Sodium borate: synonym for borax (emulsifier). Phenoxyethanol, caprylyl glycol: preservatives to protect the product against harmful bacteria, molds, yeasts due to its water content. Tobacco & bay leaf. Smells fresh and kind of citrus in my nose. A smidgen strong in the jar but it is less once it’s in the mop. You’ll notice whiffs now and then. Do I like the scent? Not really digging it but it’s alright. This is a water based so make sure to style with clean and dry hands to avoid molds and other unhealthy beings gonna make their home of it. Possible hairs, other dirt in there: remove it. Store it in a cool and dry environment. Applied it on slightly damp hair and used 3 average licks to style. The pomade is very easy to scoop out of the jar, feels creamy in the hands. Breaks down in a second and becomes oily, buttery, no dryness or waxiness at all. Goes in comfortable without tug and pull. Mixing through the hair: piece of cake. Combs through easy as well. Changing the hair’s direction to part: easy again. Styling goes very smooth: hairs were laid down immediately and stayed down. Sides were slicked down well. Normally I need a brush to get them all down but not with Wülfhed water based. It offers great control. No sticky feel. Light-medium weight in the hair. Lifting my front was a bit of a hassle for I have wavy hair and due to the oily, not sticky, not that waxy texture uneasy to tame. Waves showed up and I was not able to manage them the way I wanted. If you respect the waves’ free will, this is a great pomade to work with! Personally, I like them straightened out to a certain amount, looking clean, not bumpy and collapsing. Pomade did not settle in my hair, no firming up, kept more of an oily, wet sensation. Didn’t have to deal with loose hairs and strays at all: slick pomade. Shape: okay but not much of a height or volume. Looking back after half an hour: hair was still the same, no sag or splits going on. You’ll notice Wülfhed water based provides great nourishment to the hair and scalp. One of the shiniest pomades out there I’m aware of! This is because of the castor and avocado oil being present in front of the ingredients list. Obtained a very shiny look, that wet look. Great to achieve a 30s brylcreem look. If you have wavy hair and you ride the waves, this pomade is a great option. No evaporation of its wet look. Heavy-medium according to Michael. For my hair type: more of medium on the lighter side. About my waviness, not abnormal that a medium allows them to show through. Most mediums do that for me. Tested it in non-strenuous circumstances: temperatures around 60 ° Fahrenheit, no wind, no sweating, some sun. Hair was held together well. Hope they come with a heavy hold as well! Soft to comb through. More prominent waves. Oily, clean. No increase of hold for me. 1-2 washes with some shampoo and water and it’s out. Depends on the shampoo and hair type. Hair feels soft plus nourished.